Another no-talent idiot. Why is China overrunning with these people?!! 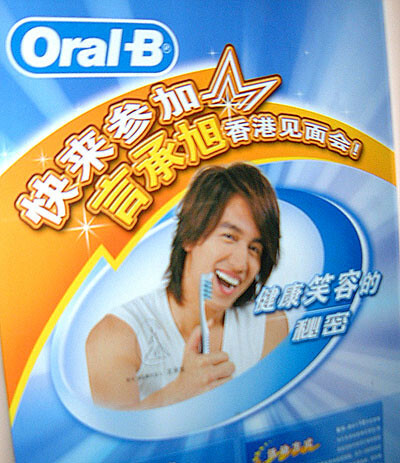 If that’s Oral-B’s Chinese name, then why is it not on the advertisement? I only see the English name. For those who don’t read Chinese, the main text says something like “Come and take part in ‘Meet Jerry Yan’ party in Hong Kong” (is this a contest? ), and the slogan next to his face reads “The secret to a healthy smile”. From a psychiatric perspective, whether this smile is healthy or not is debatable though. The penetration of advertising further and further into our living space (eg. ads in toilet cubicles) is something I loath. Maybe they couldn’t get Jim Carey. Doesn’t he have a very toothy smile? This looks kind of scarry – especially for persons who are from Europe! Interesting article in China Daily yesterday on why so many Chinese have grey teeth – it’s fluorosis from the high [natural] fluoride in the water supply, apparently. And Oral B won’t help, F4 or not. The ad was in the elevator, which had bad lighting. Because the flash reflects off the ad case, I shot from a side angle. For those two reasons, it was not a good shot at all. I cleaned it up in photoshop and cropped the fuzziest parts out. That included the Chinese name, which was at the bottom. When I went to the pharmacy to buy toothpaste in Taipei, I bought this brand. The reason I bought it was it was the only lable i could understand. yikes! um… ironically, the other day i got suckered into a 2-for-1 oral-b toothbrush deal. another vase with tousy long hair, only attractes underage girls, sign. “how this guy got fame? !” my gf said. i totally agree. Couldn’t agree more. Guys who spend that much time on their (long) hair is definitely sexually suspect. I can’t imagine any heterosexual man looking like “Jerry.” Even his name is gay! i kinda like jerry you see..and when it comes to smiling, he’s definitely a good endorser. thailand’s abound with oral-b products with jerry nowadays. and i think, long hair for the chinese male is a common thing. who cares? oral-b having a killing.. I am a Chinese who is learning English in the UK. Glad to know you are learning Chinese. Forgive my pool English. Just want to tell you, you misunderstood the meaning of 欧乐.you just translated the single Chinese character into English but the result was not right. The real mean of 欧乐 is just Chinese people try to pronounce Oral in Chinese, additionally, 欧 and 乐 are generally the positive means in Chinese, it doesn’t means ANYTHING in Chinese way. When Chinese people travel around, go to European countries, they can simply speak 欧乐 in Chinese, and shop assistant can give them the right production! Of course you can not see all English there in China, many people still don’t understand English, like English people can’t read Chinese. The company wants to enter Chinese market. They have to find a suitable name for their production in Chinese way, 呕了 means throw out,but the pronouciation is exactlly the same as Oral! obviously, 欧乐 might be the best way to pronouce Oral in Chinese also the most positive way. Just the same pronunciation,No any other meaning.